With all of his allies having abandoned him except Quentin Lance, Oliver begins to question his failings as a father, a husband, a mayor and a hero. Granting that it is in Oliver's nature to blame himself for everything, Laurel's becoming Black Canary was not his fault. She did it while Oliver was recovering from falling off a mountain and he did his damnedest to stop her from trying to replace Sara. Felicity runs to SCPD HQ from her and Oliver's apartment? All of this episode is devoted towards Ricardo Diaz pushing Green Arrow into a death trap. At the end of the episode, he declares that he isn't going to kill Green Arrow because that would be too easy. Also - how could Diaz be sure that the strung out Oliver Queen would be coherent enough to go into the trap in the first place? The main saving grace of this episode is Stephen Amell's performance. A close second is Amell's chemistry with Emily Bett Rickards and the scene in which Felicity has to convince Oliver that she is real. Paul Blackthorne gets the episode's MVP trophy, however. He hasn't always had a lot to do as Quentin this season and he doesn't really have much to work with here either. What he does have, however, he nails. The opening sequence of Green Arrow fighting his way through the mob of crooked cops looks fantastic - lighting, fight choreography and direction. The Arrow logo at the start of this episode does not include the usual swoop of symbols for the other heroes of Star City. Felicity makes a isotonic concoction, with oranges, almonds, avocados and fermented fish oil (Vitamin C, Vitamin E, Omega 3s and salt) as a hangover cure/Vertigo recovery tonic for Oliver. Felicity: We need to stop Diaz! (To John) And we have some pretty good intel. Oliver: Good intel tends to fall apart in the hands of bad leadership, don't you think? John: Oliver, come on. It doesn't have to be that way. Oliver: How would you like it to be? Oliver: On the bright side, if I get impeached, you get promoted. Quentin: (chuckling) I'm not much of a politician, Oliver. Oliver: Well, with Diaz running the city, it's not really politics, is it? Oliver: Why does everyone keep leaving me? Quentin: That's the thing about change, right? You hope you're doing the right thing, by becoming a better person. But you're also becoming a different person. Some people, they just, I guess like John, they react badly. Oliver: That I haven't really changed at all. Prometheus: Hey. What's Vertigo do? Does it show you your worst fear? Oliver: (smirking) You aren't my worst fear, Adrian. You're nowhere close. Prometheus: Oh, I know. Your worst fear is yourself. Your worst enemy is yourself. Guys like me? Ricardo Diaz? Damien Darhk? Ra's Al Ghul? When it comes to destroying you, Oliver? We all come in second place. You're the one enemy you can't defeat. The Hood: You have failed this city! And you know why. Oliver: Because I got away from you. The Hood: You were never supposed to have partners.There was never supposed to be a John Diggle. A Felicity Smoak. A Team Arrow! There was never supposed to be a Green Arrow! There was only The Mission! Oliver: ... I lost sight of that. The Hood: You lost your city! And now... you know what you have to do to get it back. Felicity: Yes, I am. It's me, Okay? The real me? Do not go through that door! Oliver: I have to. I have to stop Diaz. Felicity: And you will! But not like this. Not tonight. Oliver: He is right on the other side of that door! Felicity: So are a bunch of angry cops just waiting for you! You go through the door, what happens to William?! Felicity: Well, what happens to me? Felicity: No, I didn't! That was not me, Oliver. The real me is standing right here. And I'm not going anywhere. I'm glue, baby. Please. Felicity: How you lost it on William? That is crossing a line. I know that you have a lot on your plate with Diaz and John and the impeachment, but that is no excuse. It can't be an excuse. He is your son. And you just showed him the man that his father really is! (pauses) That is not the man that I married. Felicity determines that the security feed at SCPD HQ shuts off for 45 minutes at 10:13 pm each night when Diaz is checking up on his minions. Quentin says that Oliver visibly does not look good. Felicity's high-school science fair projected involved hacking Napster. William has no idea what Napster is. William's project involves cloning a cabbage. He's worried about beating Sarah Epstein's solar-powered hot-dog cooker. Felicity finds the proof that Diaz threatened Captain Hill's family and paid for D.A. Armand's surgery. Unfortunately, there's no way for Ollie to claim he got this information from a legitimate source. Oliver loses his temper and accidentally destroys William's science project. Felicity kicks Oliver out of their apartment. Later, Felicity appears at The Bunker and asks for a separation. Quentin suggests taking the evidence to FBI Agent Samanda Watson, since she's more concerned with justice than proving Oliver Queen is Green Arrow. Oliver hallucinates being attacked by Prometheus in The Bunker. Oliver determines that he was dosed with Vertigo by his handshake with Councilman Kullens. This is what caused him to lose his temper and start hallucinating. Oliver hallucinates being back in Queen Manor with Laurel, just before he left to sail on The Queen's Gambit. Oliver hallucinates being back in the hospital room where Laurel died, with Laurel taunting him with the idea that he was responsible for her death. Oliver hallucinates Rene taunting him from his hospital bed about Oliver being responsible for his injuries in 614. Dinah and Curtis, in costume, torment him as well. Oliver hallucinates Rissa being murdered by Diaz in his apartment and Diaz stabbing Oliver in the stomach. Oliver continues to hallucinate Prometheus during the city council meeting. The hallucination tells Oliver the only way to win is to take Diaz down that night. William wins second place at the Science Fair. The girl with the solar hot dog cooker won first, but Felicity swears she saw her project for sale on Amazon.com. 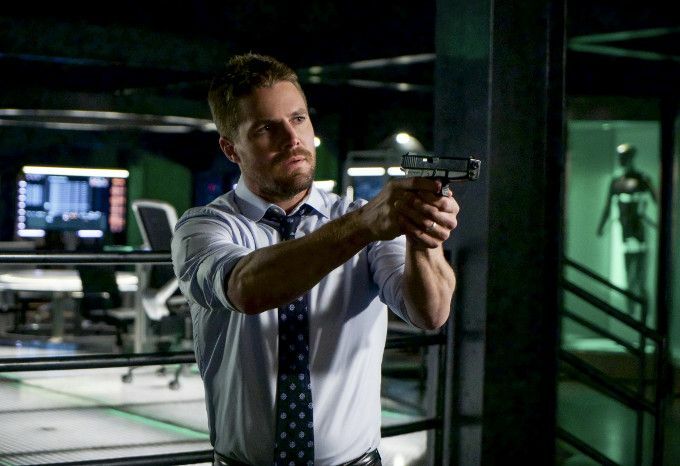 It is revealed that Oliver hallucinated Felicity chewing him out and kicking him out when she showed up at The Bunker. Oliver attacks SCPD HQ in his original Hood costume. Felicity is able to talk sense into Oliver. They escape SCPD HQ before Diaz and the cops emerge from the trap. Oliver Queen is impeached from office. Quentin Lance becomes the new mayor of Star City. Oliver decides that he needs to get back to basics and go it alone as Green Arrow to take down Diaz. Diaz tells Black Siren that the next step is to send out the word to other criminal enterprises that Star City is now open for business. Even though it it is blatantly obvious that Diaz is attempting to divide and conquer his way into controlling Star City, the big lesson Oliver takes from his vision quest in this episode is that he has to go it alone even though his entire heroes' journey is devoted to his NOT being a crazed loner. Ricardo Diaz's reasons for not killing Green Arrow don't make a lick of sense. Especially given that all of this episode was devoted to setting up a death trap for him! This episode has no right to work as well as it does, given the idiotic plan of the villains and Oliver ultimately taking the wrong lesson from recent events before he inevitably realizes The Power Of Friendship. The primary reason it does work is because of some effective direction and the strength of Stephen Amell, Emily Bett Rickards and Paul Blackthorne's performances. That said, there's some effective dialogue and psychodrama here but the whole thing seems really derivative of Three Ghosts from Season 2. That may be intentional as that was one of the first episodes that set Oliver on the path to becoming The Green Arrow and trusting other people, with this episode having Oliver learning the opposite lesson.